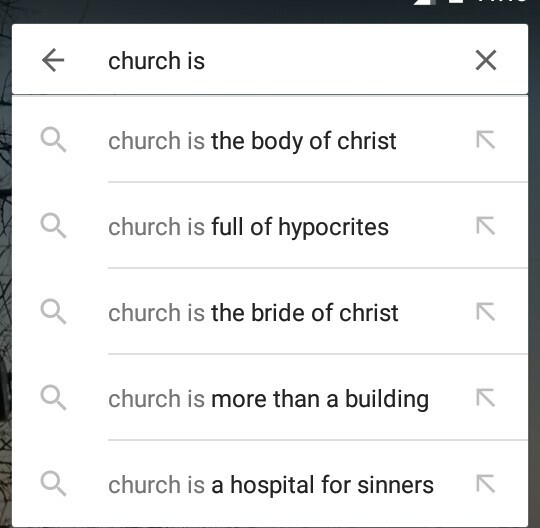 I thought I would type in: the Church is....and see what popped up. The results as you can see from the picture above are interesting. 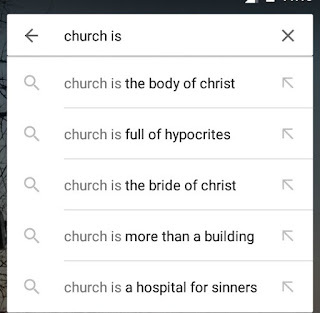 It got me thinking, what is the Church? To some a charitable organisation, to others a place of corruption or as the picture says: a place 'full of hypocrites.' To some a place of safety to still others a place of bad memories and hurt feelings. Recent days on a certain Facebook Christian blogging group have seen some concerning attitudes displayed; arrogance, personal attacks and an assumption by some that any differing opinions are 'false, 'pagan' 'dangerous' and need to be censored, attitudes that are somewhat less than Christ-like have been displayed. But that isn't the whole story, the church can be responsible for the greatest acts of kindness and service, that isn't what gets reported though; there only seems to be interest when things go wrong or we screw up. "You can please some of the people all of the time, you can please all of the people some of the time, but you can’t please all of the people all of the time”. So I suggest doing and being the one thing that matters...a reflection of Christ...let us emulate His love, His courage, His service and His sacrifice; we may not always get it right... Wait scratch that, we WILL not always get it right, but let's do our best and start with ourselves, cut out the fighting and bickering and commit ourselves to being Christ-like and Christ-centred. Of course we will still fall out and disagree, but let's disagree as mature Christian adults as brothers and sisters in Christ. Then when we ask people the question 'who do you say we are?' They will see Christ reflected in us and long for that light in themselves. 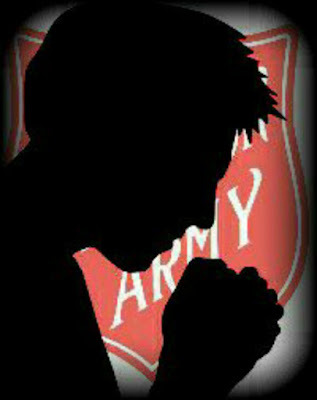 Hi Peter, I saw your post in the Christian Bloggers group. Very good article. Amen to this: I suggest doing and being the one thing that matters...a reflection of Christ...let us emulate His love, His courage, His service and His sacrifice; we may not always get it right... Wait scratch that, we WILL not always get it right, but let's do our best and start with ourselves, cut out the fighting and bickering and commit ourselves to being Christ-like and Christ-centred.